DMA conducting student Jordan Randall Smith, who serves as Symphony Number One’s music director, was named one of 10 Baltimore Social Innovation Fellows by the Warnock Foundation. Symphony Number One was recognized for its work to promote social good through music and serve all of Baltimore. With the added funding and support from the foundation, Symphony Number One will be giving free concerts across West Baltimore in February and March 2017. Thanks for the thoughtful review, Doug! What should I get the music lover in my life who is a fan of both traditional repertory and performance practice, as well as cutting-edge new music? Symphony Number One, led by DMA conducting student Jordan Randall Smith, was featured by The Baltimore Sun in a review of the orchestra’s season-opening program at Emmanuel Episcopal Church in Baltimore, Maryland on September 24 and 27. Senior music education and saxophone student Sean Meyers, student of Gary Louie, premiered the Concerto for Alto Saxophone and Chamber Orchestra by Andrew Boss (MM ’13, Composition) alongside Mahler’s Symphony No. 4 with soloist Amanda Williams (MM ’14, GPD ’15, Voice), soprano. “From the lush opening chord and the questioning response it generates from the saxophone, the music pulls you in gently,” wrote music critic Tim Smith of Mr. Boss’s saxophone concerto. “Saxophonist Sean Meyers offered technical aplomb and keen expressive nuance throughout.” Ms. Williams “sang with consistent sweetness of tone and clarity of articulation, bringing the text to life endearingly.” Read the full review here. 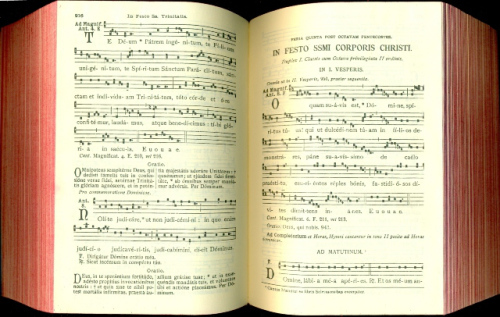 The Liber usualis is a valuable resource for musical scholars; as a compendium of the most common chants used by the Catholic Church, it is particularly useful for identifying the origins of chants used in polyphonic compositions. Using Optical Music Recognition and Optical Text Recognition, Search the Liber usualis presents a scanned, searchable version of this important resource. Published by the Distributed Digital Music Archives & Libraries Lab and sponsored by the Single Interface for Music Score Searching and Analysis (SIMSSA), this is a proof-of-concept demonstration for the larger task of providing search capabilities for all digitized musical works. Below, a Palm Sunday antiphon with scrolling notation.